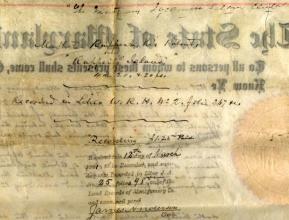 Back before the invention of the typewriter, deeds were handwritten. Sycamore Island's short, 2-page deed can be read below even today (transcribed version is below the images). In 1889, the Club formally bought Sycamore and Rupperts Island from Mathew Ruppert and his wife Mary Eva for a hundred bucks! Actually, Matthew Ruppert was one of the founders of the Club who obtained title to the land some months earlier (see below) with the express purpose of creating the club on the islands. In fact, the club had been formally organized as early as 1885, even before the islands were legally in hand. 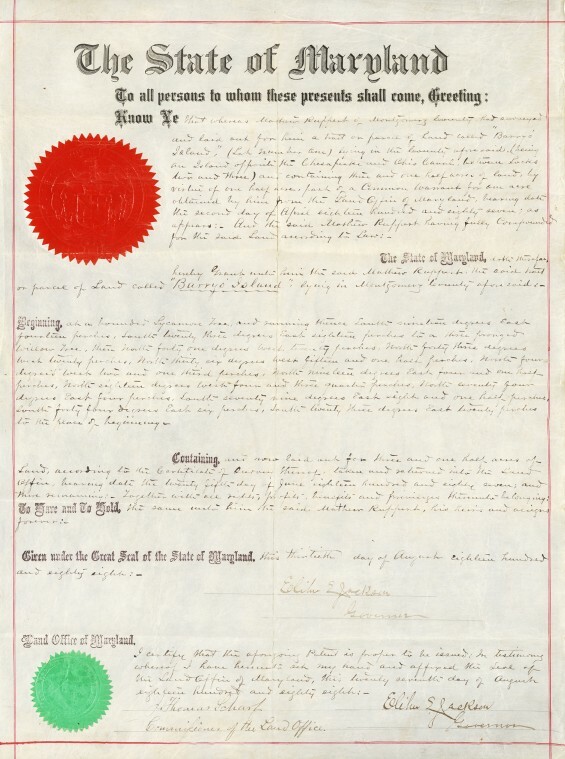 This deed made this 24th day of May in the year 1889 by Mathew Ruppert and his wife, Mary Eva of Washington City in the District of Columbia. Witnesseth that for and in consideration of the sum of One Hundred Dollars and for other valuable and good considerations the receipt whereof being hereby acknowledged the said Mathew Ruppert and Mary E. Ruppert his wife, doth hereby grant to the "Montgomery Sycamore Island Club," a corporation duly incorporated under the laws of Maryland the following tract part of a tract piece or parcels of land located and being in Montgomery County in the State of Maryland called Barrys' Island and particularly described as follows to wit: Beginning at a bounded Sycamore tree and running thence South 19 degrees East 14 perches, South 23 degrees East 18 perches, to a three-pronged willow tree, then North 4l degrees West 20 perches, North 43 degrees West 20 perches, North 36 degrees West 15 ½ perches, North 4 degrees West 2 1/3 perches, North 19 degrees East 4 ½ perches, North 18 degrees West 4 ¾ perches, North 74 degrees East 4 perches, South 79 degrees, East 8 ½ perches, South 44 degrees East 6 perches, South 23 degrees East 20 perches to the place of beginning, containing and now laid out for three and one half acres of land, it being the same tract of land, mentioned and described in a patent from the State of Maryland to the said Mathew Ruppert dated the 20th day of August in the year 1888 and recorded in liber W.R.H. No. 2 folio 266 and one of the land records of the Land Office of the State of Maryland as on reference thereto will at large appear: also all that other tract part of a tract piece or parcel of land lying and being in said Montgomery County and being an Island in the Potomac River called Ruppert's Island and described as follows to wit: beginning at a bounded Maple tree marked C.G.W. and running thence North 60 degrees West 10 ¾ perches, North 51 ½ degrees West 16 ½ perches, North 16 degrees East 25 perches, South 79 degrees East 17 perches, South 43 degrees East 9 perches, South 16 degrees West 30 ¾ perches to the place of beginning containing and now laid out for four acres, two roods and twenty perches of land, it being the same tract of land mentioned and described in a patent from the State of Maryland to the said Mathew Ruppert dated the 30th day of August in the year 1888 and recorded in liber W.R.H. No. 2 folio 267 and in one of the land records of the Land Office of the said State. The said mentioned tracts of land being two Islands in the Potomac river opposite the Chesapeake & Ohio Canal between Locks No. 2 & 3. Witness our hands and seals. 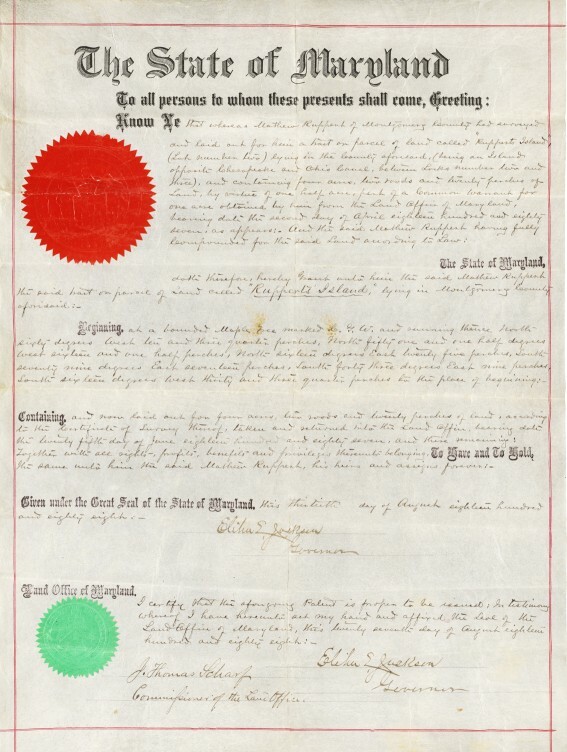 I hereby certify that on this 24th day of May in the year 1889 before me the subscriber a notary public in and for the District of Columbia, personally appeared Mathew Ruppert and Mary Eva Ruppert his wife and acknowledged the foregoing deed to be their respective act. 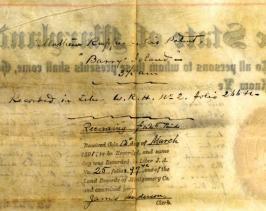 Given under my hand and Notarial Seal this 24th day of May A.D. 1889. 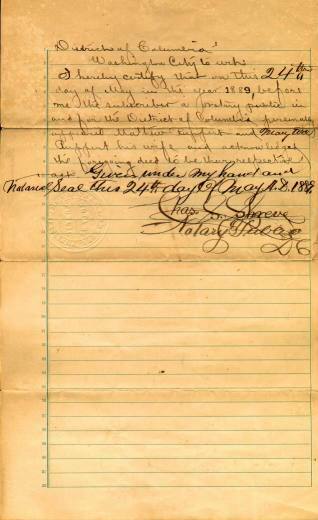 I HEREBY CERTIFY, that the aforegoing is a full, true and correct copy of a Deed from Matthew Rupert and Mary Eva Ruppert, his wife, to "The Montgomery Sycamore Island Club," recorded May 28th A.D. 1889 in Liber J.A. No. 13 at folio 380, one of the land records of Montgomery County, Maryland, truly taken and copied therefrom. IN TESTIMONY WHEREOF, I have hereunto subscribed my name and affixed the seal of the Circuit Court for Montgomery County, Maryland, this 30th day of December, A.D. 1926. (Seal) Preston B. Ray, Clerk of the Circuit Court for Montgomery County, Maryland. FOR THE RECORD: In the year 2001, the original record of the deed, copied in long-hand, was indeed found in the Office of Land Records at the Judicial Center in Rockville, Maryland, in Liber J.A No. 13, Folio 380.
day was recorded in Liber J.A. land records of Montgomery Co.
FOR THE RECORD: In the year 2001, the original record of the Land Patent, copied in long-hand, was indeed found in the Office of Land Records at the Judicial Center in Rockville, Maryland, in Liber J.A No. 25, Folio 97. "The Montgomery Sycamore Island Club"
FOR THE RECORD: In the year 2001, the original record of the Land Patent, copied in long-hand, was indeed found in the Office of Land Records at the Judicial Center in Rockville, Maryland, in Liber J.A No. 25, Folio 98.